They don't teach you this in school, but most every art or talent we usually give the Romans credit for was bought or more likely stolen from somebody else. Roman painting, sculpture and architecture were seldom more than a grandiose pastiche of the Greek, and plenty of the other Roman trademarks – religion and superstition, gladiators, rectilinear surveying and town planning (for a good example, see the small Etruscan city of Kainua in Marzabotto's Parco Storico di Monte Sole), portrait sculpture, sewers, togas and even concrete – were simply taken over whole from Rome’s nearest neighbours and favourite victims, the Etruscans. When Rome was still a collection of mud and timber huts among the miasmal swamps of the Tiber, the Etruscans were collecting Greek urns, reclining on couches at their lavish banquets and dressing up for the races. Their direct ancestors, according to current thinking, were the Villanovians, who were given that name after their culture was first discovered at a place called Villanova in Castenaso, 8km south east of Bologna (since then Villanovian artefacts have also been found as far away as Campania). Etruscan culture would go on to blossom in Tuscany in the 8th century for the usual reasons – most importantly, a nice surplus of ready cash. Just as classical Athens’s rise to prominence was financed by the silver mines at nearby Laurion, Etruria exploited the mineral wealth of the Colline Metallifere and Elba; there was plenty of iron, especially, for weapons and for exports. Cities grew opulent as trade boomed. Etruscan houses were simple and wooden, but their tombs were filled with art, painting and sculpture. 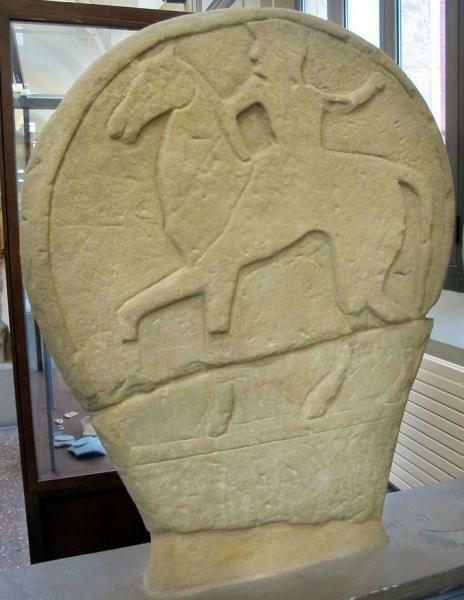 Unlike the Etruscans of Tuscany, however, those living in the Po valley did not bury their dead in tumuli or painted tombs, but often under remarkable large circular tombstones carved with reliefs (there are good examples in Bologna's Archaeology Museum. 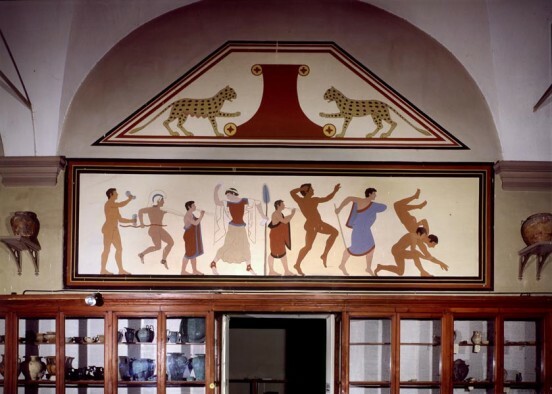 But like their compatriots to the south, the northern Etruscans made beautiful bronzes, ceramics and jewellery, and had a taste for ancient Greek pots, besides making copies of their own. They leave the impression of a people who, whatever their flaws, were wonderfully alive. Etruscan art is full of expressive faces that either wear a smile, or are blissfully caught on the verge of breaking into one. They seem cheerfully devoted to the joys of this world. Indeed, their contemporaries dropped plenty of gossip about Etruscan hedonism and licentiousness (much of this comes from the devoutly male-chauvinist Greeks and Romans, shocked at a society where women seem to have enjoyed considerable rights and respect). In any case, it would be difficult to find anyone in antiquity more fashion-conscious. Elaborately carved mirrors and make-up cases constitute a large part of the Etruscan collection in any museum, and the evidence from tomb frescoes suggests the ladies also liked to dye their hair blonde. The jewellery is remarkable, coiffures and clothes often elaborate; in art you will hardly ever find two Etruscan ladies with the same hairdo. Their shoemakers were famous around the known world; the fashions of the 5th century, as shown in frescoes, featured pointed, curling toes. Another of their talents was music; Etruscans are often pictured dancing or playing the trumpet, the lyre, and, most commonly of all, a sort of pan-pipes. According to a Hellenistic Greek account, they even used music in their hunting; pipers would play charmed melodies to draw the animals out of their lairs and towards the nets. Such a story is not surprising, considering another essential Etruscan trait, an attachment to magic and fortune-telling unsurpassed in the ancient world. Etruscan augurs, or haruspices, scrutinized the livers of sacrificed animals and scanned the skies for birds to fortell the future. Their skill was so great that haruspices were still employed around the Roman Empire in the 4th century AD, the last people on earth who understood the Etruscan language. Nobody knows quite why, but after 500 BC everything started to fall apart for the Etruscans. Manufacture and art declined, slave revolts became common, and the archaeologists report that everything from tombs to pottery were being made less skilfully, more cheaply. The once-formidable Etruscan navy was getting regularly whipped by the Greeks, while the Celts destroyed the colonies in the north like Felsina (Bologna) that had been built up with so much painstaking effort for so long. Most dire of all were the Romans. Rome’s closest Etruscan neighbours, Fidenae and Veii, were captured and wiped out in 425BC and 396BC. Veii suffered an epic siege of ten years, and, typically, during that time none of the other Etruscan cities did much to help. Chronic disunity among the members of the Dodecapolis allowed Rome to gobble up Etruria a bit at a time. The last important city, Volsinii, fell about 350BC, and from then on Etruria was nothing more than a Roman province – the first of many. But the cultural heritage of these gifted people was too great to disappear completely. The Romans, as we have seen, swallowed Etruscan culture whole, and they passed quite a bit of it on to us. Hundreds of words in modern languages probably stem from the Etruscan, by way of Latin: person, for example, which originally meant an Etruscan theatre or ritual mask, or temple (this meant one of the 16 sections into which the Etruscan augurs divided the sky for divination by bird flight). The Etruscan influence on the art of the Renaissance is a fascinating subject that has never been thoroughly explored. When medieval Tuscans revived the art of fresco painting, they probably had no idea they were simply following in the footsteps of their ancestors. Raymond Bloch, an authority on the Etruscans, noticed an eerily perfect resemblance between Donatello’s famous St George, the very model of quattrocento prontezza, and an Etruscan head found long ago at Veii. In one of Michelangelo’s sketchbooks we see an image of the Etruscan god Atia, undoubtedly copied from the frescoes in a tomb. And all those little faces we see staring out at us from Renaissance sculptural friezes, frescoes and book decorations are called ‘grotesques’, because Raphael found their originals in a painted ‘grotto’ in Rome. This was really a floor of buried rooms of Emperor Nero’s palace, the famous Golden House, decorated in a style inherited from the Etruscans of old.